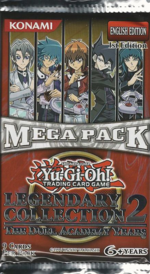 Legendary Collection 2: The Duel Academy Years Mega Pack is a Mega-Pack released with Legendary Collection 2: The Duel Academy Years binders. Each binder came with five Mega-Packs. The set has been released in English, German and Italian. The set features many cards from the Yu-Gi-Oh! GX era, including cards used by Jaden Yuki, Aster Phoenix, Jesse Anderson, Chazz Princeton and Zane Truesdale. It also includes cards used by Bastion Misawa, Thelonious Viper, Yubel, Marcel Bonaparte, Alexis Rhodes, Nightshroud, Yusuke Fujiwara, Midori Hibiki, Amnael and Adrian Gecko. It reprints cards from the "Lightsworn", "Elemental HERO", "Gladiator Beast", "Cyber", "Alligator", "Darkness", "Destiny HERO", "Venom", "Six Samurai", "Evil HERO", "Crystal Beast", "Kuriboh", and "Yubel" archetypes and cards from the "Darklord" series. This set also introduced 1 card to the TCG, "Gladiator Beast Lanista". With this set, "Gallis the Star Beast" and "Darkness Destroyer" were also made legal in North America, and a number of other exclusive prize cards and promotional cards (such as "Dark End Dragon" and "Darklord Desire") were mass-distributed for the first time. Kevin Tewart has stated that "everything in [Legendary Collection 2], from concept to finish", was designed by him. Syrus Truesdale was originally planned to be on the cover of this pack as well, since his "roid" monsters were also originally planned to be included. According to Kevin Tewart, the demand for this set was high enough that it resulted directly in the creation of the Ra Yellow Mega Pack set. The demand for the Ra Yellow Mega Pack set was then high enough that it resulted in the creation of the Ra Yellow Mega Pack: Special Edition set.